The Tac Link is a great choice for securing tactical accessories. 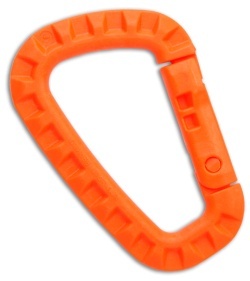 It is a high strength polymer "carabiner" with considerable weight and cost savings over metal climbing carabineers. All of the external components are high strength molded polymer, which eliminates metal noise and paint scratches. Measures 3-3/8" x 2-1/4" and weighs 0.8 ounce. This item is not designed to be used for load bearing, lifesaving or climbing activities.